Home Health Opened the season of the hunt for gravitational waves. Opened the season of the hunt for gravitational waves. A new era for astronomers began in September 2015: after the LIGO detector caught the signal of the confluence of black holes that were more than a billion light years away, we can say that gravitational wave astronomy became a fully-fledged part of physics. In total, it has been possible since that time to restore the signals from 10 fusions of black holes and one fusion of neutron stars. The previous observation period ended on 25 August 2017 and now, after a year and a half's break, during which the characteristics of the main detectors, LIGO and Virgo, have been considerably improved, a new session starts. It is intended to last for a year, but the first results did not come long: yesterday a candidate for a gravity route of the joining of a few black holes was registered. On April 1, after a 19-month break, the third cycle of experiments began with the registration of gravitational waves on two American detectors of the LIGO complex (Laser Interferometer Gravitational-Wave Observatory) in Richland (WA) and in Livingstone (Louisiana) and at an installation in Italy near Pisa Virgo, owned by the European Gravity Observatory (EGO). The announcement of this appeared in the magazine on 2 April nature; A few days earlier, both American and Italian project participants published information about approaching this event. The final technical preparation for the operational start of the detectors (the so-called engineering run, the engineering run) began on March 4 and was successfully completed towards the end of the month. A new round of gravitational wave observations calculated for 12 months will be longer than the previous cycles. As before, this program also includes the smaller Anglo-German gravity wave detector GEO600, which is located near Hanover. At the end of this year, the Japanese instrument KAGRA, the fourth main detector, should be employed. The first two rounds of observations on LIGO and Virgo gave unique results, which marked the start of gravitational wave astronomy (see Gravitational Waves – Open !, "Elements," 11.02.2016). They enabled us to detect ten black hole mergers and clashes of neutron stars, 130 million light-years from the Earth, discovered on August 17, 2017 (see neutron-star fusion registered!). The third round is expected to deliver even more impressive results. During the modernization of the LIGO and Virgo installations, their sensitivity had almost doubled. The LIGO complex can now register a neutron star fusion at distances of up to 170 megaparssecs (550 million light years) against 110 megaparssecs in the second round; the Virgo detector horizon for such events is 50 megaparsecs (160 million light years). The upper limit of the distances at which it will be possible to observe the confluence of black holes will be billions of light years. It is expected that during the third observation round the detectors will detect gravitational waves much more often than before. If previously the LIGO and Virgo collaboration received gravity signals once a month on average, the theoretical estimates suggest that the registration rate will increase to once a week. This was achieved through a number of technical improvements – and especially through the improvement of laser equipment. Here it is necessary to remember something. Both observatories use highly magnified and extremely complicated versions of the instrument (see Michelson Interferometer), with which the famous American physicist Albert Michelson discovered at the end of the 19th century that the speed of light is strictly the same in all directions. During the installation, a parallel beam of light fell on a translucent plate and was divided into two mutually perpendicular beams, which were reflected by mirrors at the same distance from the plate. Then the light rays merged again and fell on the screen, where the interference pattern appeared (light and dark stripes and lines). If the speed of the light depends on the direction, then this image must change as you rotate the entire installation, if not – stay the same. Michelson and his assistant Edward Morley found no changes and proved that the speed of the light beam does not depend on the direction. 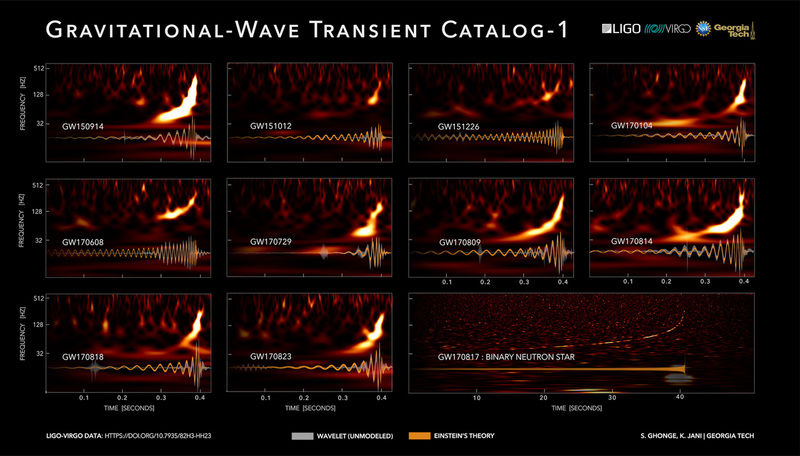 The interference detector of gravitational waves works in a similar way. The passing wave distorts the space metric and thereby changes the optical length (the path that light travels from the distributor to the mirror) of the shoulders of the interferometer perpendicular to each other, one extending and squeezing the other (Figure 3). As a result, the interference pattern changes and this change must be registered. It is easy to imagine that the practical implementation of this idea is loaded with huge technical problems. The gravitational wave traces of cosmic cataclysms that reach the earth are so weak that they change the length of the light path in both interferometers with a value in the order of 10-16-10-17 That is why their registration requires super-precision equipment, without which LIGO and Virgo simply could not work. They use lasers as a light source, and combine high power and extreme frequency stability. Mirrors must be perfectly flat and perfectly reflective, the vacuum in the tubes through which light is distributed is as deep as possible, the mechanical stability of the entire system is almost perfect. In addition, the length of the interferometer arms should not be meters, such as Michelson and Morley, but kilometers (4 kilometers for the LIGO detectors and 3 kilometers for the Virgin). The installations contain mirrored light accumulators that multiply the effective length of the interferometer and thereby increase the sensitivity. In general, compared to modern detectors, the Michelson interferometer looks like a cabin against the backdrop of a skyscraper. To prepare for the third observation cycle, the LIGO and Mago installations were equipped with new powerful laser beams. In addition, for the first time in this round a specially modulated "pressed" light (pressed light) will be used, which is less dispersed over quantum fluctuations of the physical vacuum and therefore better preserves the interference pattern. A technique for generating such light, based on the principles of non-linear optics, has been proposed for interferometric gravitational wave detectors in the 1980s (D.F. Walls, 1983. Pressed states of light). It has been tested on the GEO600 installation since 2010 and has proven its effectiveness (R. Schnabel, 2017. Flipped states). The modernization of the LIGO and Virgo detectors not only makes it possible to record space cataclysms with a higher frequency, but also extends the possibilities of gravity astronomy in other respects. It is therefore possible that it is now possible to follow the movement of black holes and neutron stars "on the way" to the fusion and to receive information about the dynamics of these processes. The researchers also expect to detect absorption through a black hole of a neutron star, which is reasonably possible in theory, but has not yet been observed in practice. In a more distant future, scientists expect to register the gravitational radiation of rapidly rotating neutron stars devoid of axial symmetry. According to the general theory of relativity, they must generate gravitational waves, although weaker than those associated with the merging of neutron stars and black holes. By the way, the same applies to ordinary stars, but the detection of their gravitational radiation still ignores the possibilities of even the most promising detectors. For the sake of completeness, it is impossible not to speak of another direction of gravity astronomy, which has not attracted the attention of the general public so far. In 1986, professor of physics and astronomy at the University of Cardiff (now one of the leaders of the GEO600 collaboration and, incidentally, the author of the excellent book Geometric Methods of Mathematical Physics published in the Russian translation), Bernard F. Schutz considered the theoretical possibility to use gravitational wave detectors for measurements of the Hubble constant, which determines the rate of expansion of the universe (BF Schutz, 1986. Determination of the Hubble constant from gravitational wave observations). Later the technique he proposed was called the method of standard sirens (standard sirens, see DE Holz, SA Hughes, 2005. Use of Gravitational-Wave standard sirens) – by an obvious analogy with the standard candle method (standard candles), in those used in astronomy stars from the Cepheid family and type Ia supernovae. After receiving (on August 17, 2017) a gravity signal from joining a few neutron stars, this technique was first used in practice (The LIGO Scientific Collaboration, The Virgo Collaboration et al., 2017). ). She estimated the Hubble constant with a very mediocre accuracy of about 15%, and confirmed the old truth about the first pancake once again. Nevertheless, theorists believe that an increase in sensitivity and an improvement in the calibration of gravity detectors will make it possible to reduce this error to two percent in five years, and to one in ten years (H. Chen et al., 2018.) of standard sirens within five years). This branch of gravity astronomy (in fact gravity cosmology) is promising. Here, however, the reader will have to accept my word, since the description of the standard siren method is far beyond the scope of this article. Finally, I would like to note that Virgo employees have developed software that allows them to send messages about newly discovered gravity signals to the Internet with just a five minute delay (details on gw-openscience.org). This will enable both professional astronomers and amateurs to immediately start with optical (and also neutrino!) Observations of the alleged sources of these signals. It didn't take long to wait: a candidate for the gravitational route of joining a few black holes was registered yesterday. 1) Gravitational waves are open !, "Elements", 11.02.2016. 2) LIGO caught new bursts of gravitational waves, "Elements", 20/06/2016. 3) Nobel Prize in Physics – 2017, "Elements", 10/13/2017. Next articleVideo .. Learn more about the main functions of the smartphone Huawei P30 Pro!